For this look, I started off with the astonishingly gorgeous “I’ll Catch You” from Model City. 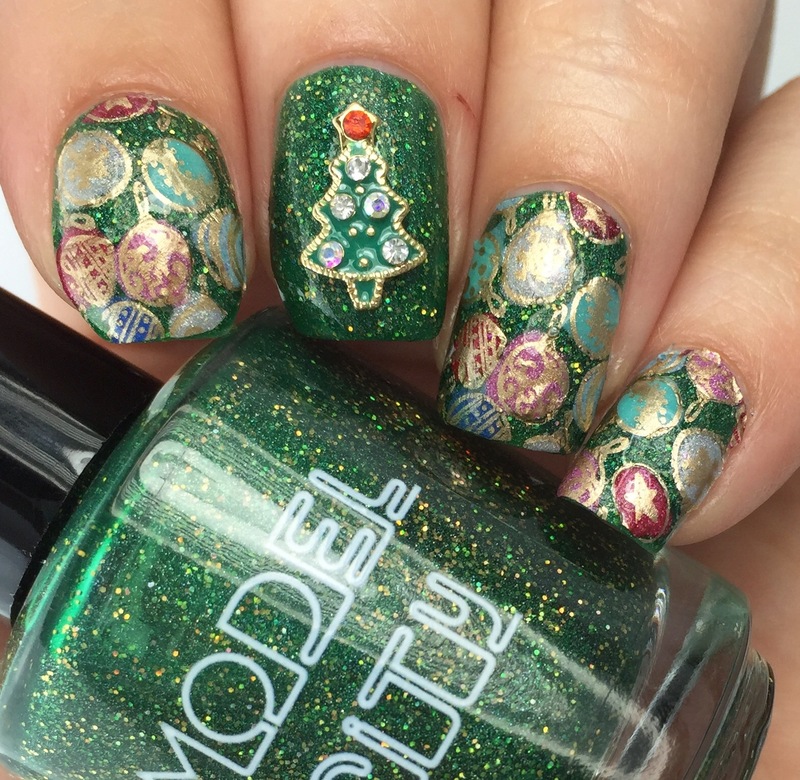 For me, the pine green holo loaded with gold holo glitter gave this look the perfect impression of a Christmas tree catching the light and colors of its decorations. 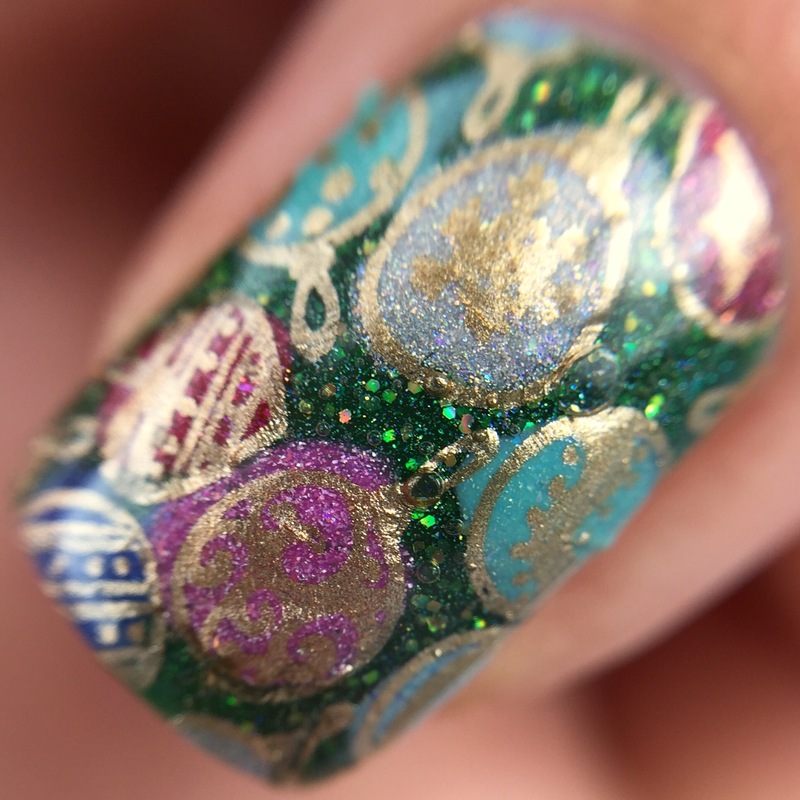 Gold holo glitter, how I adore thee. 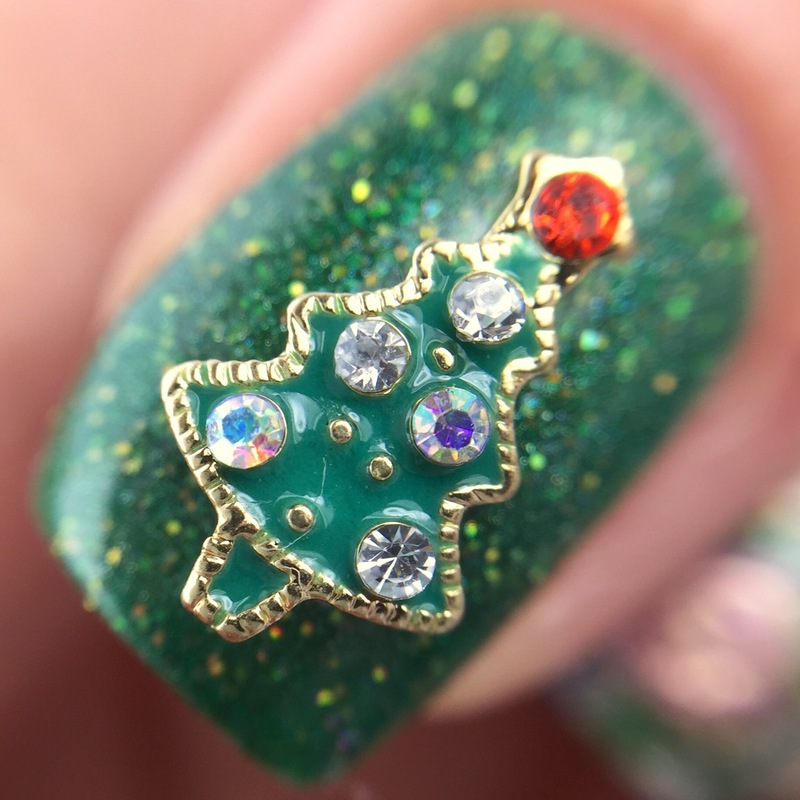 For an accent, I used a Christmas tree charm from Daily Charme. I love the idea of quickly zazzing things up with charms- they kind of give you a color palette to work with and some inspiration. Plus they’re fairly inexpensive (this was $2.99 for two of them) and totally reusable. Works for me! From there I decided that I would try my hand at reverse stamping (making stamped decals) for the first time ever. Just off the bat, I would like to say that I am really not great at most thing I try for the first time (but I experiment! for science! )- I keep waiting to discover that I’m miraculously amazing at something and I have had this hidden talent all my life. This is a way that I convince self to try random new things. For the record, I haven’t found the hidden talent yet. Anyways, decals were hard to do. 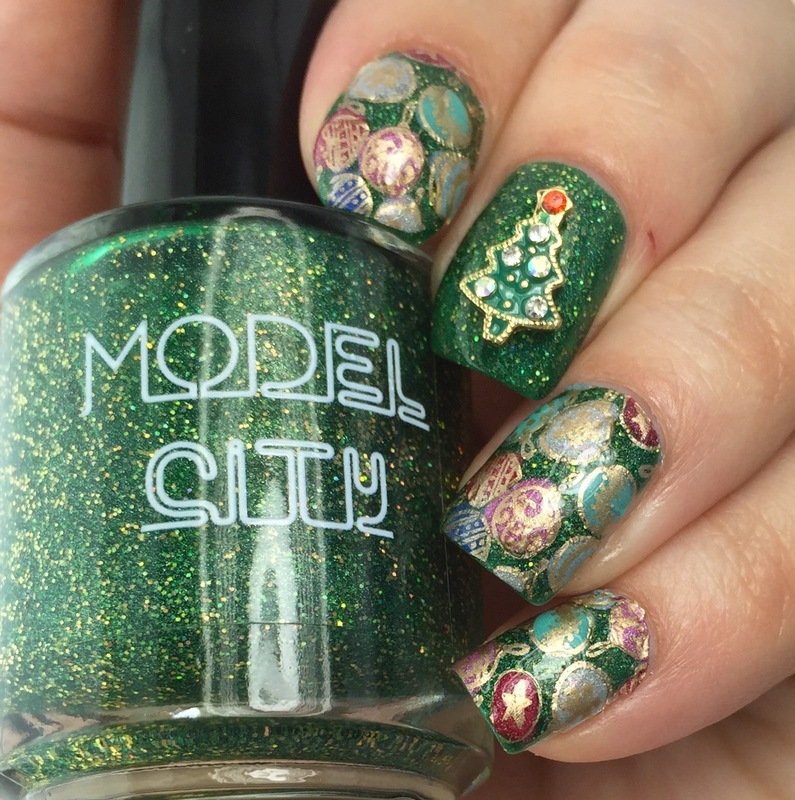 I tried (using Uber Chic’s fabulous Christmas plate) and created some mad lumpy decals that are distinctly not colored within the lines. But, hey, they work, right? Less Target-designer-holiday and more Dr. Seuss’ Christmas, but hey, I’ll take it. Next time I think I’ll use a dotting tool instead of trying to glob color on with the regular brush. I cannot make decals very well either! Staying within the lines is harder than videos make it look. And you’re not late. You’re *really* early for Christmas 2016. Hahahaha yesssss so early! 😀 Seriously people are amazing at this and I feel like a Kindergartener in remedial art. 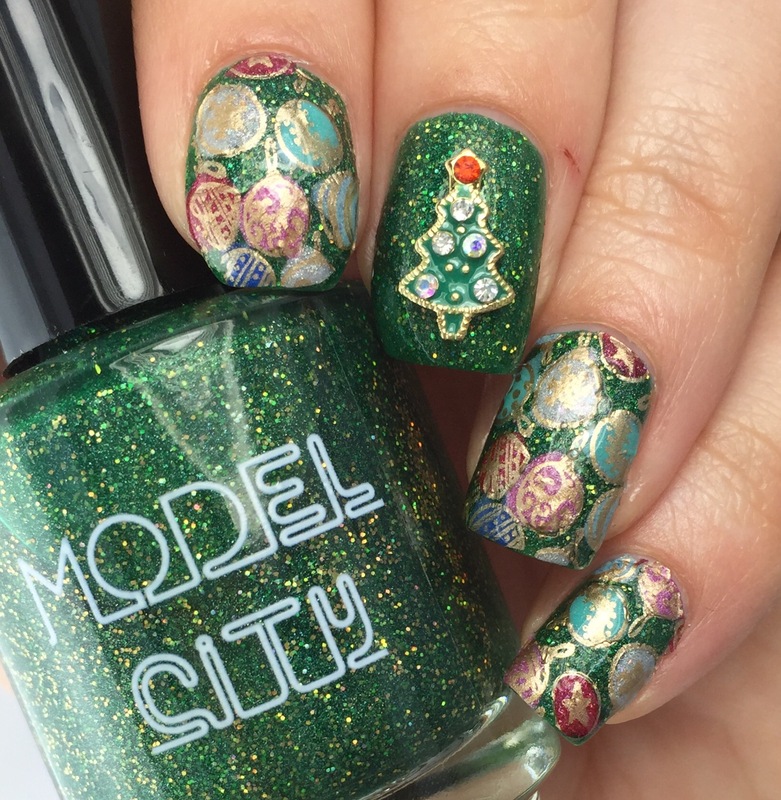 I love that glitter base. It makes it so pretty. I have that same charm and totally forgot to use it this year. Ah these came out so beautifully.